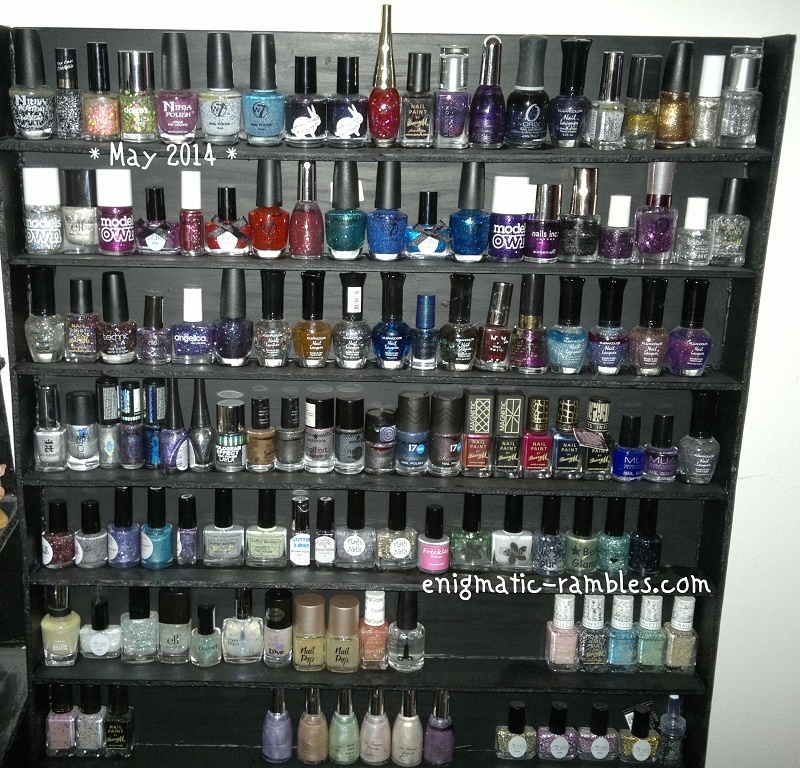 My collection began to grow, gaining 28 polishes, along with my shelf creating ability. 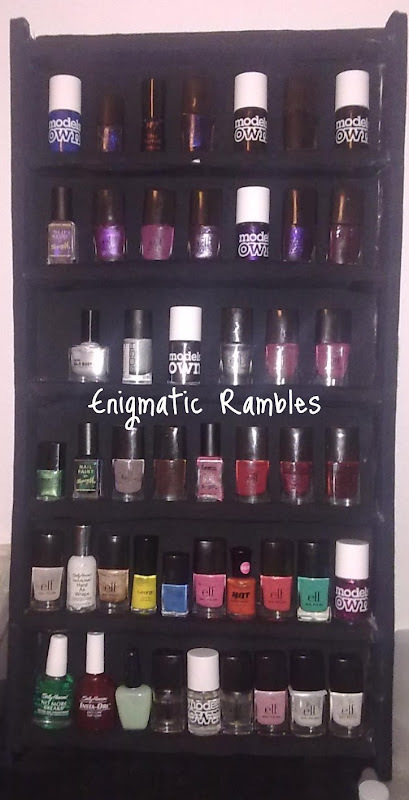 So somewhere between 2011 and 2012 I acquired a lot more polish (164 polishes) which meant I had to make a bigger shelf, this one was made with some plasterboard. So by 2013 my collection had grown again, although not as much previous years, gaining 24. The growth this time was mainly down to a Ciaté advent calendar. 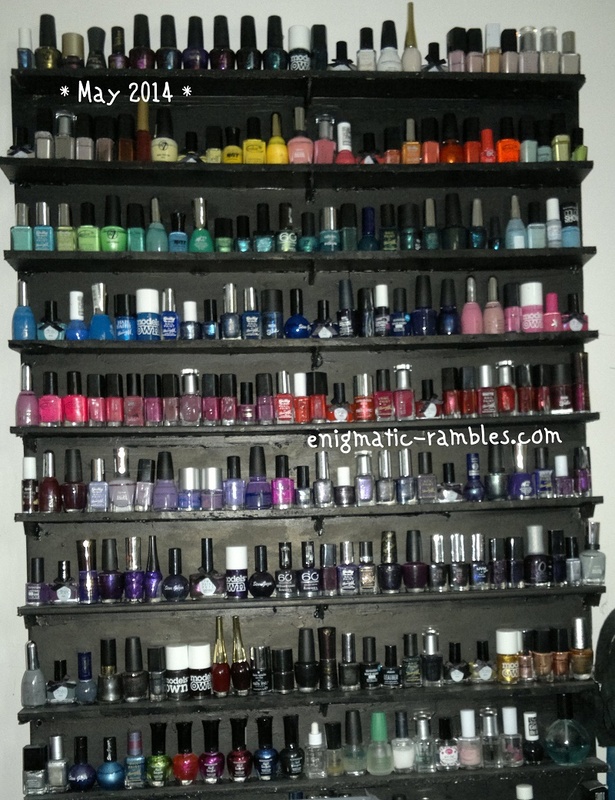 Exactly one year later, I had made a foamboard nail polish shelf for my glitter polishes as well as the main shelf I had been using for a few years by then. 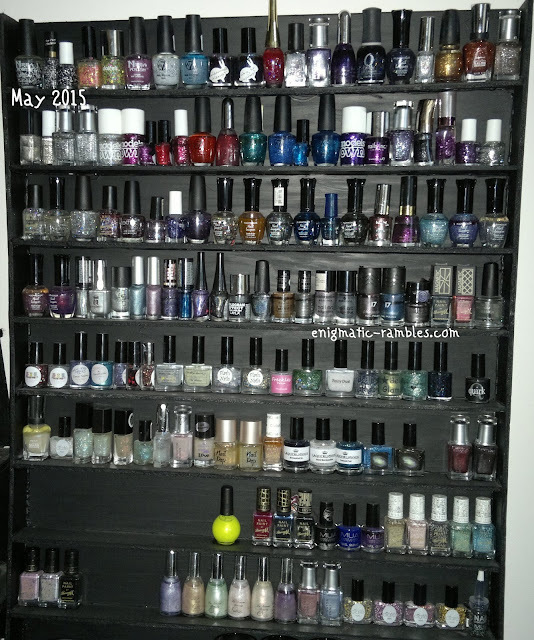 My collection grew a lot (gaining 126 polishes) because I had won an indie, Barry M and a Jacava giveaway! 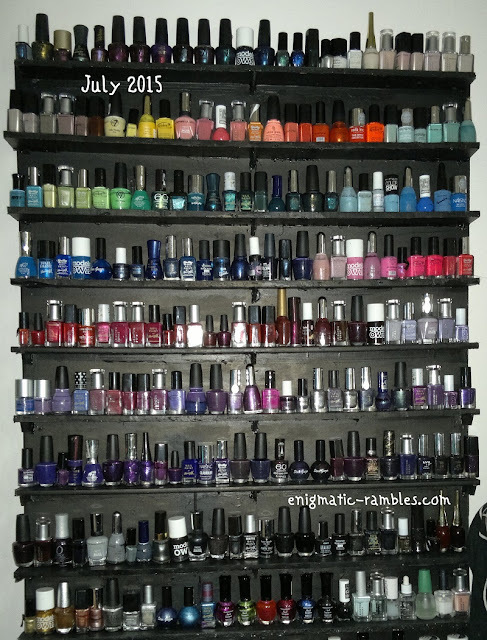 Which brings us up to date in 2015, my collection hasn't grown much in the past year, gaining around 34 polishes. The total includes base and top coats which really don't count, right? 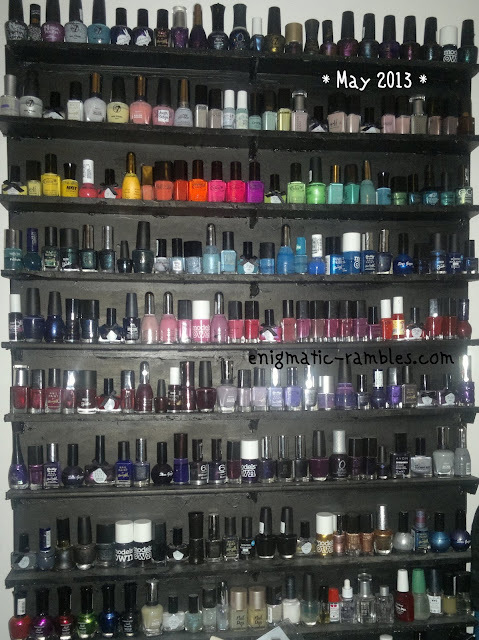 So that is my nail polish collection from 2010 through to now 2015. 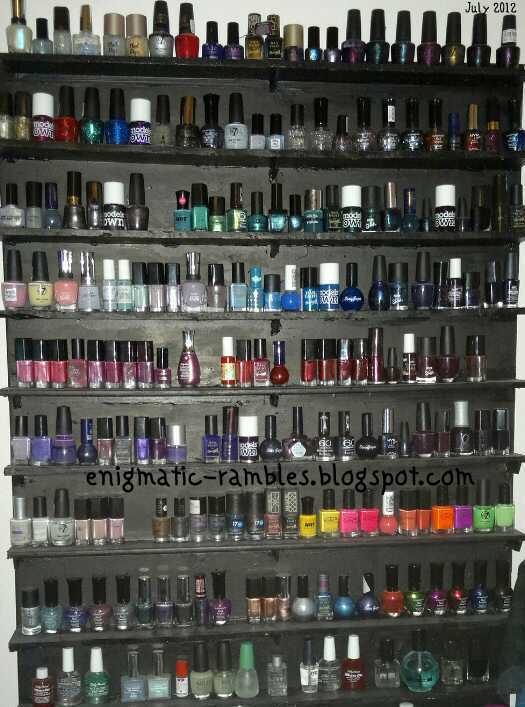 Going from 19 polishes all the way up to around 395. 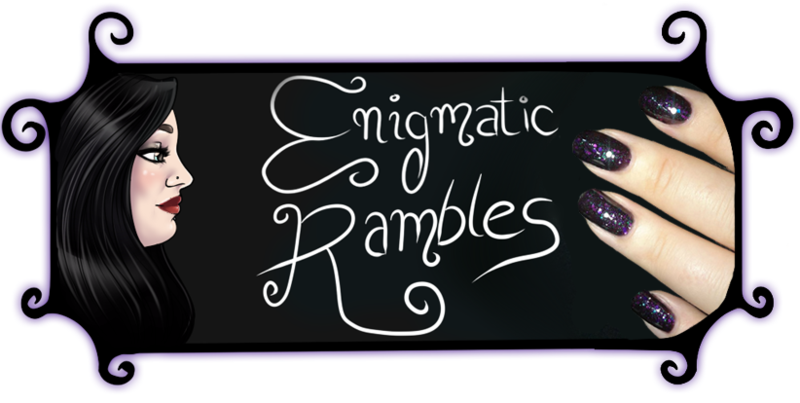 Of course while my totals show I have been acquiring new polishes it doesn't show that I do use polishes up, finishing at least a couple of polishes a month. With the growth of the collection there has been a need for some new storage along the way and when I couldn't find any I liked I ended up DIY'ing some shelves. One from plasterboard and the other from foamboard. 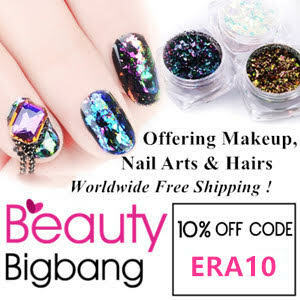 How many polishes do you own? How many is 'normal'? Ooh, that's interesting! I'm tempted to do something similar! "Normal is an illusion. What is normal to the spider is chaos to the fly"
i was down to like 10 but seems i start buying again these days, especially when there is a sale... i use the excuse of looking for the perfect pumpkin orange and mossy green and bloody red but... no... that's not the entire truth. i doubt there is a 'normal' amount! How many do you think you have now?